The following seven lessons by Rabbi Hillel Ḥayim Yisraeli-Lavery to help the student prepare for their reading of Megillat Esther. The nusaḥ taught is Israeli style Ashkenaz-Lithuanian. 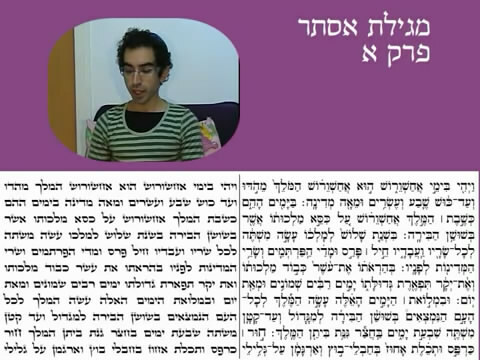 “פורים | Learn the Kriyat Megillat Esther with Rabbi Hillel Yisraeli-Lavery” is shared by R' Hillel Ḥayyim Lavery-Yisraëli with a Creative Commons Attribution-ShareAlike 4.0 International copyleft license. Please reciprocate for any adaptation or redistribution of this work by (1) properly attributing the work to R' Hillel Ḥayyim Lavery-Yisraëli, (2) clearly indicating the date you accessed the resource and whether any changes have been made (and if so, please be in touch with us and leave a comment below so that we might note your adaptation or improvement), (3) providing a link back to this source, and (4) specifying the Creative Commons Attribution-ShareAlike (CC BY-SA) 4.0 International copyleft license under which this work was shared. 2012-02-28 at 4:33 am · Reply. 2017-12-26 at 10:54 am · Reply. it contains all the special pieces and a big example of the beginning.